Route 66 from Topock arrives in the historic downtown center of Kingman near the railroad depot, where the old road is known as Andy Devine Avenue; from here a continuous stretch of the highway extends for 105 miles further east, through mostly uninhabited land with just a few small towns (Truxton, Peach Springs, Seligman), ending at junction 139 of interstate 40 - 23 miles west of Williams. Scenery en route is a mixture of steep-sided mountain ranges and wide valleys, mostly free of woodland, covered only by grass or sagebrush. In Kingman the road veers north to cross a short hilly area then enters the main commercial part of town, passing a long array of motels, fast food restaurants and other businesses, development that persists a little way after the I-40 crossing, but once past Kingman Airport, the surroundings are mostly untouched desert. 12 views along Route 66 between Kingman and Williams. 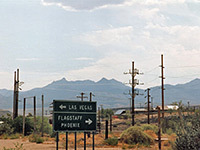 The main towns with hotels in this part of Route 66 are Kingman, Williams and Flagstaff. East of Kingman, Route 66 follows the Burlington Northern Santa Fe (BNSF) railway across the rather barren landscape of the Hualapai Valley, a very wide flat plain that stretches northwest for over 50 miles towards Lake Mead. The valley is crossed by a long sandy side-track (Antares Road), fine for all vehicles, that passes many scattered ramshackle dwellings typical of the Arizona desert, all surrounded by rusty machinery, abandoned outbuildings and old cars. Other features of interest along the way include Red Lake, a colorful dry lake bed, and large forests of Joshua trees around the north end of the road, near the junction with the main route to Pearce Ferry. The valley is bordered to the northeast by the Grand Wash Cliffs, a high sandstone range that marks the edge of the Colorado Plateau, and provides an obstacle to Route 66, which has to bend back south then follow a ravine (Truxton Wash) through the edge of the hills. 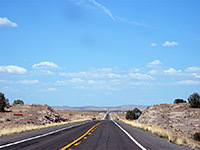 East of the Hualapai Valley, the highway is still designated Route 66 but it does not quite follow the original route, since it has been rebuilt a short distance to one side to reduce gradients and straighten curves, as this road was one of the last sections to be replaced by the interstate. Often, the earlier road can still be seen at one side (usually south) of the current highway, always a narrow track, sometimes asphalt with weeds, other times just overgrown stones, but still recognisably a road. For 20 miles past the nice old town of Truxton, Route 66 runs through the south edge of the Hualapai Indian Reservation, which occupies a large area of virtually roadless land south of the Colorado River. Peach Springs is the tribal headquarters for the reservation - a small settlement but with houses quite widely dispersed over a flat valley. The area is dusty and often very hot in summer. A 23 mile unpaved track leaves from the north edge of town and descends along Peach Springs Canyon, a very scenic ravine that ends at a beach next to the Colorado, at the bottom of the Grand Canyon. Another track into the reservation backcountry is the Buck and Doe Road, reaching the popular Grand Canyon Skywalk, and many other much more tranquil places such as Hindu Canyon and Meriwhitica Canyon. Just east of Peach Springs, a third (paved) turn-off leads across a uninhabited, forested landscape of rolling hills to Havasu Canyon, just one of the countless branches of the Grand Canyon. The Grand Canyon Caverns are a located short distance south of Route 66, 12 miles east of Peach Springs, however they have no real connection with the canyon. The limestone caves may be toured by an underground trail, reached by an elevator, that has close-up views of various formations. As with much of this part of the old route, the land at either side is fenced off, but there are occasional stopping places suitable for primitive camping. Continuing east, the distinctive, straight escarpment of the Aubrey Cliffs gradually approaches Route 66 from the north, coming closest near Seligman; an atmospheric town of a few hundred inhabitants, with old cars rusting at the side of the street, small ponies tethered to railings, Harley motorcycles parked outside the bars, and only a few tourist gift shops. The cliffs are over 1,000 feet high and extend for 65 miles towards the Colorado River. I-40 can be rejoined at Seligman (exits 121 and 123), though Route 66 continues for 18 more miles, parallel to the interstate but far enough away still to be quiet and peaceful, passing over land that is partly covered by ancient overgrown lava, this being at the edge of the great San Francisco volcanic field that extends all the way to Flagstaff. Route 66 merges with I-40 just west of Ash Fork, but it reappears 17 miles beyond in Williams. Most people who visit this town are just stopping briefly en route to or from the Grand Canyon, 56 miles away on AZ 64, and today Williams has a rather faded air due to the inevitable decline after being bypassed by I-40 in 1984, the final part of the route to be replaced. The only other main road to leave town is FR 173, which allows access to a wide expanse of wooded country to the south including the remote, colorful Sycamore Canyon. Route 66 runs right through the middle of Williams, orientated east-west. In the town center, the road splits into two parallel one-way streets that are lined by many interesting curio shops and other old stores. 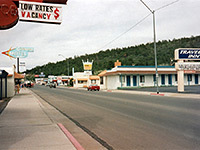 Many of the buildings are typical of such towns, with style and decor dating from the 50s and 60s, when traffic along the route was at its peak. 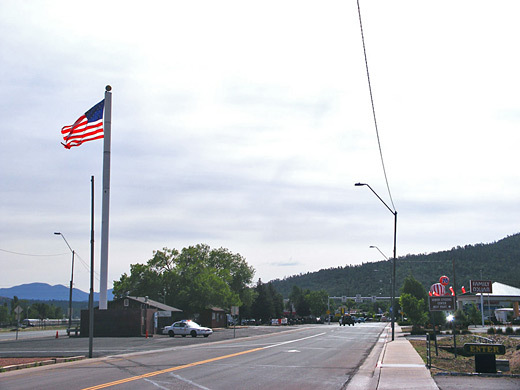 The original road peters out either side of Williams; Flagstaff has the next significant surviving section of Route 66, a 16 mile stretch that forms the main street through the north of town, beside the railway. For the next 200 miles east across Arizona only short parts remain, through several small towns such as Winslow, Joseph City and Holbrook; no longer sections are found until Gallup in New Mexico.